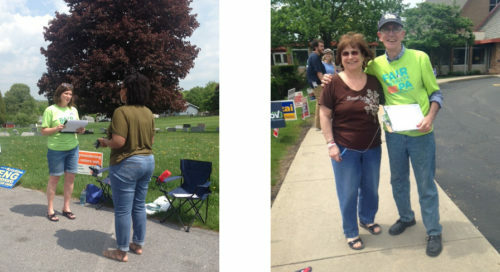 More than 600 volunteers from across the state donned their Fair Districts PA t-shirt or button and hit the polls on Primary Day. We had a presence at over 100 strategically selected polling places in almost two-thirds of Pennsylvania’s 67 counties. We were literally in every corner of the state (Erie, Greene, Philadelphia and Wayne counties), as well as the “Centre” and numerous places in between - from Butler to Bedford to Berks. Volunteers, working in shifts from the 7 am opening of polls until the 8 pm closing, spent the day educating voters about the extreme gerrymandering that has tainted Pennsylvania’s congressional and state legislative districts for far too long. Many voters were aware of gerrymandering, but not of possible solutions; some had never heard the word; others thought the recent PA Supreme Court case solved the problem (it didn’t). After a short conversation, most voters were eager to support our nonpartisan solution. Volunteers invited voters to take action by signing our petition urging their state legislators and other elected officials to replace our current hyper-partisan redistricting process with an impartial, independent citizens commission, with strict rules for fairness and transparency. Other states have done it, and it works. We also signed up voters to receive timely action alerts and news. We’re still counting, but it looks like we will exceed 12,000 new signatures. We would have hundreds, if not thousands, more if not for rain and lightning (and in some cases tornado warnings) interfering with our outreach in the afternoon and evening. No matter where we were in the state, our nonpartisan solution appealed to voters from all political backgrounds. Voters were supportive no matter where we were, whether at a majority-Republican poll in a rural part of York County; a majority-Democrat poll in the heart of Philadelphia; or a “purple” poll in PA House Speaker Mike Turzai’s district in northern Allegheny County. 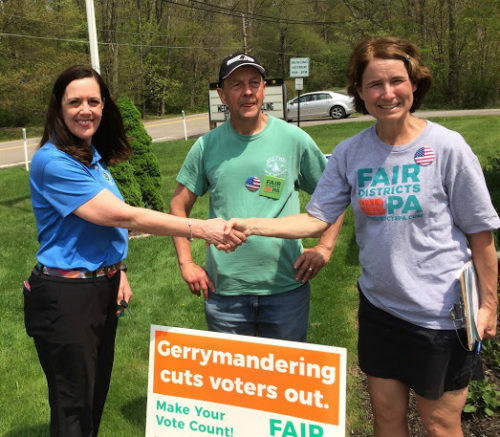 Pennsylvanians from across the political spectrum understand that gerrymandering hurts all of us, because it makes politicians less accountable. Other highlights from the day included conversations with state legislators and other elected officials - including those who vocally support us, as well as those who have reservations but are willing to talk. It was a great day for democracy and for voters in Pennsylvania. There are over 7,000 polls in our state, so chances are you didn’t see a Fair Districts PA volunteer at yours. But you can still be part of the effort to end gerrymandering in Pennsylvania and make your vote count!